I am not the target market for abstract games, but this game hangs enough theme on its bones to interest me. Perhaps it makes sense to someone that the Indians are chasing the buffalo and not using a better strategy, but it seems rather abstract to me. Let me be upfront: there appears to be some strategies that work better than others. I do not see this as a flaw, but something you learn as you play and have to combat if you see someone doing something that is a better strategy. This isn't a game that you will want to master, but more of a casual game. If you over think it, you might break it or have everyone else gang up on you. If you are ahead, others will target you and you can fall back to the group. The game is easy to learn and simple to play. The strategy allows for "off the wall" thought that can pay off sometimes. Sometimes. The game does allow you flexibility in decisions and it is fun to see what works and what does not. The components are a mixed bag. The rules are very good. Overall, I think the game succeeds yet this isn't the greatest game in the world. It should be a nice enough game to put an abstract game in your collection. If the theme (yes for an abstract) appeals to you, then it gets a bonus point. I'm going to keep it for a few more plays and see how it goes. Not an instant buy. The components are a mixed bag. I like the board. It is a good size with nice big hexes. 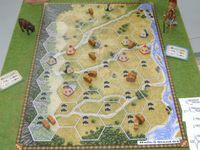 The wooden blocks are nice and the buffalo "meeples" are fantastic (think and big). I was really happy up to this point. Then comes the punch outs. We get cheap paper teepees that I have to cut and fold myself. They look okay, but they are cheap and hard to use. I really do not like putting components together by myself (at all!). I also hate folded components made of paper that are not good quality. The player aids are made of the same cheap paper. While this is a more functional and acceptable use of the cheap paper, I am not happy about the decision. The rule book is fantastic. It is made of very nice paper (better than some of the components) and is a folded up sheet. It works fantastic and is presented in full color. The pictures are great and the examples are sub par. You can read this in a couple of minutes and be up and playing. Everything in the game works and is easy. There are not a lot of unnecessary rules or exceptions. The object of the game is to get all of your teepees on the board and/or over the cliff. The player with the most teepees on the plains wins the games. A. 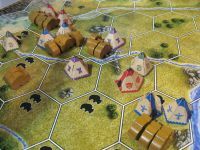 Move a teepee: one spot per turn (it cost one resource to move to an area already having a teepee). All players in the space pay the resource if possible. B. Get more resources: Number of buffalo in a post minus number of teepee in areas where you only have a teepee (no other players) and take that number of resources. The game ends when no teepees are left in the game. The player who got the most teepees across the board and into the open plains wins. On your turn, you take the two mandatory actions in order and then take 1 of the 4 possible optional actions. For an abstract game, the game has a decent theme (make sense of that!). While I'm not a huge fan of abstract games, I do like this game. I am not sure there are not dominant strategies that could win if other players do not combat it, but I would need more plays to know this for sure. The game might last a little too long so many might make a house rule to move it along. I do not like player elimination in the game and it can happen in this game. This is more of an abstract game for lighter gamers or people who don't play a lot of abstract games. Keeper for us. For now. How do you feel about the game now? Still in your collection? Haven't played too much. It is a game that I'm likely to get rid of if another huge purge comes. Otherwise, it sits and collects dust.